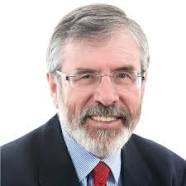 Gerry Adams, Leader, Sinn Fein. The Irish Independent has issued an apology to Sinn Féin Leader Gerry Adams TD over its failure to give due prominence to a decision in favour of Mr Adams by the Press Ombudsman. The latest development follows several decisions by the Press Council to uphold complaints by Mr Adams about articles in the Irish Independent and Sunday Independent. On 17th October 2014, the Irish Independent published a decision of the Press Ombudsman, affirmed by the Press Council on appeal, upholding a complaint by Gerry Adams that a statement in an article published on 17th May was an unfounded accusation, in breach of the Code of Practice for Newspapers and Magazines. The decision was published on Page 22 of the Irish Independent. Today, the Independent said that as the article of 17th May was published on page six, the decision should have been published on one of the first six pages of the newspaper, and apologised to Mr. Adams. Previous PostMinister to address ICSA National Conference.Next PostBallymote library reportedly targeted for closure.